The Insurance Corporation of British Columbia (ICBC) is a crown corporation offering auto insurance and identification services for the province of British Columbia. 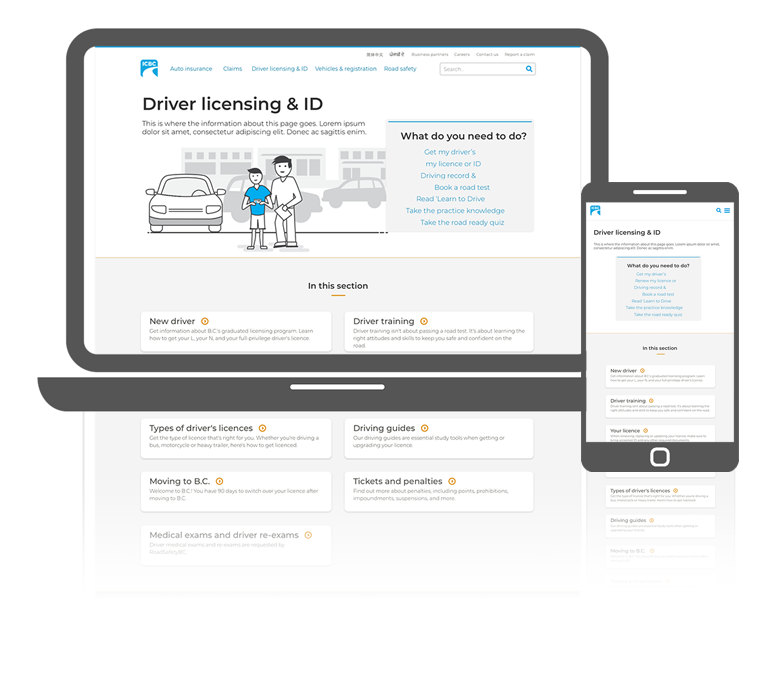 Nearly all 4.6 million British Columbians interact with ICBC in one way or another. prepare to support the rollout of various online services. After the home page was completed, I assumed lead position in the rest of the redesign effort, partnering closely with writers, content strategists and developers. Borrowing key learnings from the atomic design approach, we have been able to execute on the changes through operational releases with minimal costs rather than attempt to push through a rushed implementation as one large project. This also allowed us to iterate on previous designs as required. I’d love to chat more about my experience with this ongoing project. Please contact me for access to the full case study, including details on my approach and the changes on icbc.com. Or if you already have the password, proceed by clicking on the “Read on” button below.